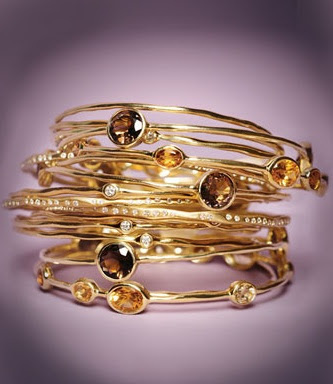 Ippolita's stack of bangles definitely aren't cheap - with each bracelet retailing for approximately $500 and up. Henri Bendel has a similar stack of bracelets which retail for $98, still a little pricey but definitely more affordable than the Ippolita bangles above. Click here if you're interested in purchasing. *Update - 11/4/10* - Another option (although each bangle comes separately) is this version from Lori's Shoes. Each bracelet is $12, so you could still stack a few and it would be the least expensive option. Click on the photo below if you're interested in purchasing. Great find... those bangles are gorgeous! 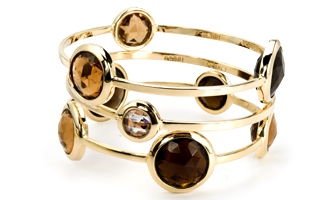 Cache has an even closer matching "look for less" in gold and silver in their new fall collection. I think they are around $40?